should remind buyers of property's assets. If you are reading this, chances are you have a home to sell. Are you using art on the walls? You should be. And what's best is using art that makes your home look better to buyers. That means non-personal, non-objectionable, non-controversial art. That means images that put people in a happy frame of mind, images that create a feeling of luxury or leisure. And whether you are using prints, drawings, posters, paintings, or anything else framed, the bigger the better. Who Will Buy Your House? I still don't have access to the condo we’re going to buy, but I have my measurements and my photographs to help me brainstorm staging ideas. Most likely our buyers will be a retired couple, because most of the residents in that complex are retirees, and because there’s no outside maintenance, and because it’s a one story unit. However, there is no reason the unit would not make a perfect rental property. The layout makes it possible for two singles to live there, with two separate entrances and two full baths. It would also work well for a young couple, a single adult, or a single parent with one child. So, I’m not going to pitch my staging to a particular demographic. The outstanding feature of the property is its water access and water view. To drive home this point, I want to hang art that emphasizes the location. I have two matching silver frames, with glass and white mats. I’ll do a bunch of abstract, pastel, watery water colors, just squiggles of blue and green, and frame the two I like best. I have an oversized print of the sunset, beach and sailboat scene that’s kinda schmaltzy. I found it at Goodwill yesterday. I’ll cut out the part I like and frame that in a silver frame I also found at Goodwill for $3.99. 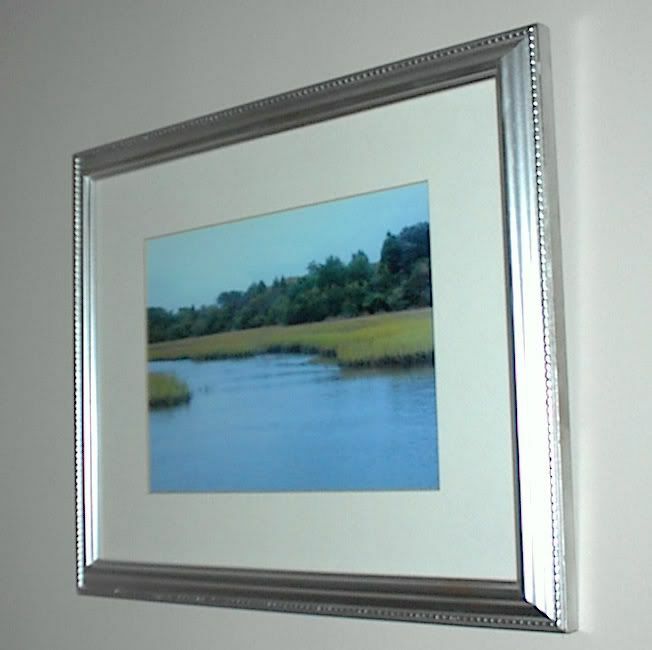 I have a 20 x 16-inch white frame with glass. I’ll tear a page from one of Mr. Lucky’s out-of-date navigation chart books, showing local water depths and such, and frame that. I love those charts because they are so pretty – creamy white and pale blue with lots of little numbers. Nothing too distracting, but it will appeal to any boater. I have a large acrylic painting I did of boats that now hangs in our living room. It’s got some dark colors, but I’ll put it in the room where I plan to have some dark furniture and create a manly kind of TV room. I have two black and white photographs of sailing yachts that I love. The wooden frames are dollar store frames, and I bought the reasonably priced art for staging from art.com. One suggestion I make in my home staging eBook is that sellers make available disposable cameras at an open house. If you buy more than five at a time from www.customcameracollection.com, they can cost as little at $3.55. I always take pictures if I am looking at a home on the market. If I decide not to pursue the purchase, I simply delete them. But as long as I’m interested in the property, the photos stay and help me remember all the details, including some I might not have even noticed. Use this idea to help buyers remember your property at the end of a day of viewing a few.